OHES were called to the site of a multinational beverage manufacturer to assist them in mitigating their losses following a large release of Gas Oil from their generator. 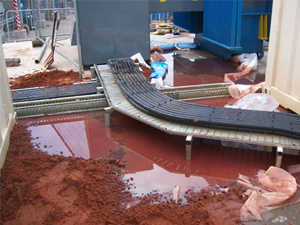 The spillage had entered the trade effluent drainage system and forced factory production lines to stop. Oil had also entered and contaminated the ground and also surface water drainage so putting the environment at risk. Facing an ever increasing business interruption claim it was imperative that immediate action was taken to recover the oil, protect the environment and allow production to resume at the earliest possible opportunity. OHES staff took control of all aspects of managing this loss by arranging and funding emergency clean up operations utililising our network of UKSpill accredited responders to tanker away significant quantities of oil from the site drainage system; our consultant mapped out contamination and initiated a programme of remediation on site and on adjacent third party land; throughout our staff communicated with the Environment Agency, Local Authority and affected third parties and held regular briefing sessions with our client and their insurers. Rapid and decisive action greatly minimised claims costs and prevented our client from being prosecuted for causing pollution. All our consultants are experienced, commercially aware individuals tuned in to the very specific needs of insurers, claims handlers, loss adjusters and the insured within the limits of policy cover. OHES were called to assist when a pump transferring waste oil to a 35,000 litre tanker suddenly failed. Between 1000 – 2000 litres of waste oil sprayed over a concrete yard, steel fencing, gates, equipment and tankers. The tanker was moved so that it was located over the site interceptor to enable waste oil to be hosed directly into it. 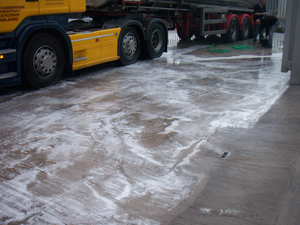 Two contracting companies were mobilised – one to scrub and clean down the contaminated concrete yard and tanker and the other to pump the waste oil from the interceptors using a vacuum tanker. 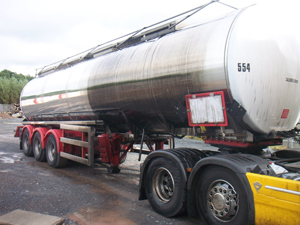 The tankers were successfully cleaned and this enabled them to proceed with pre planned journeys thus avoiding loss of revenue and customer dissatisfaction. The site was restored and the site operator was delighted with the speed of response and calm management of the situation by OHES.